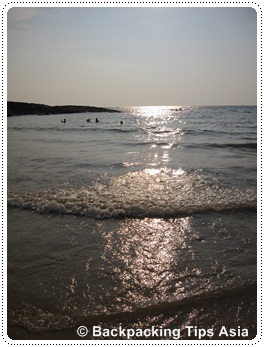 Kovalam is one of the most visited beaches in south Kerala. 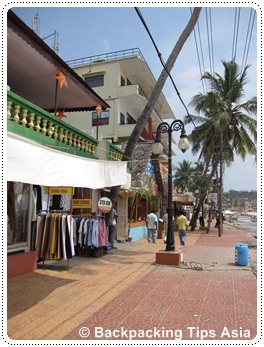 Its younger competitor, Varkala, is another popular option among travelers. We spent some time at Lighthouse Beach and Hawah Beach (the neighboring beach to Lighthouse). Lighthouse Beach is where most of the backpackers and tourist hang around. The beaches are OK and bit cleaner than Varkala. The currents are strong, but compared to Varkala you can actually take a swim without worrying about your life so much. The water wasn't crystal clear and you can clearly see it's polluted. The beaches are filled with local sellers who sell sarong, hand made cards and lots of fresh fruit which they can cut up for you (pineapple, mango and bananas). Along the beaches are dozens of restaurants, guesthouses, resorts, internet cafes and shops. If you want sarongs, it's cheaper to buy it at the stores (from Rs 150) than from the beach sellers (Rs 450). One of my class mates bought a pineapple for Rs 100. As you can see, it's not exactly cheap. 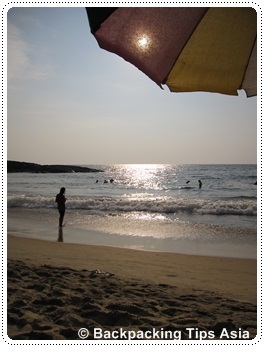 Kovalam is touristy, and therefore not the cheapest place in Kerala. Rental of sun umbrella and beach chair cost in total Rs 150 per person. They will approach you and ask if you want to rent. One of the things you're going to notice a lot when staying in Kovalam, is the tourist police using their whistle quite often. They whistle when the locals come too close the foreigners. It's a good thing if the locals are creeps, but otherwise it's more like locals being 'chased away' from their own land. The one thing I didn't like about Kovalam was all the staring. Of course, staring is not an unusual factor when visiting India. But it's awkward to lay there in your bikini, and the locals stare at you that it becomes uncomfortable. By air: The nearest international airport is in Trivandrum. From Trivandrum there are buses and taxis that go to Kovalam. Trivandrum is about 16 km from Kovalam (20 minutes by taxi). If you take a pre-paid taxi (the counter is just outside the arrival hall), it will cost you around Rs 400 to Kovalam beach. 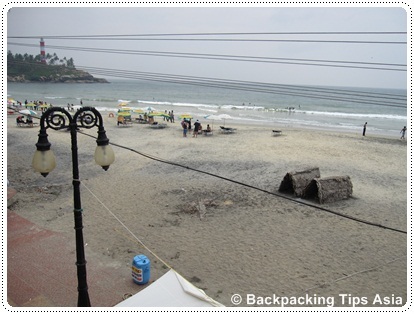 By bus: When backpackers arrive in Trivandrum, many of them go straight to Kovalam. If you want to travel cheaply, there are regular buses to Kovalam from Trivandrum (Rs 9), leaving from East Fort. 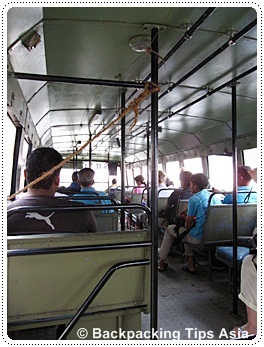 You get on board the bus, and during the journey a conductor will go around the bus and collect money. It's an easy and effortless ride, in my opinion. Buses to Kovalam leave every 20 minutes. The end of the stop takes you to Hawah beach. The stop before that takes you to Lighthouse Beach. Just ask the conductor to let you know when you're approaching Lighthouse Beach. We took the local bus several times to Kovalam. The local buses in Kerala are large, slow and there are some moments when you feel the bus is going to break down into pieces. They're pretty shabby, but they take few unnecessary stops. The road was mostly paved, humpy at certain places. The nice thing about taking the local bus is that you get to know the locals. On the way to Kovalam, I got to know a sweet lady who owned a massage parlor in Kovalam. By train: There's no train station in Kovalam. 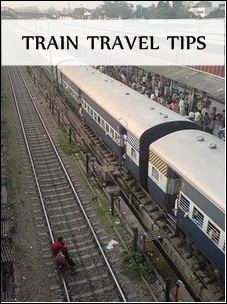 The nearest railway station is in Trivandrum. Trivandrum connects with all major towns and cities in Kerala, Goa and Tamil Nadu. 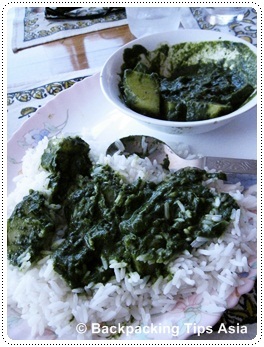 Looking for a place to eat in Kovalam? Here are the restaurants we tried at Lighthouse beach! 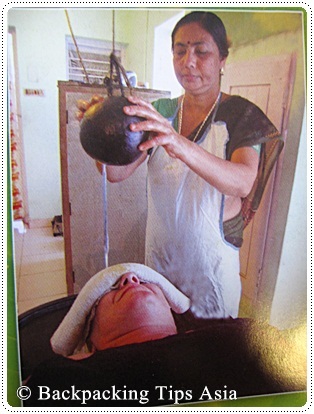 Looking for a place to get ayurvedic massage in Kovalam? Great, here's my review of Anjaneya Ayurvedic Health Center near Lighthouse Beach in Kovalam. Feedback, say hello or want to add a correction to Kerala Kovalam beach? Do it here!